Early on the morning of 19th September, while it was still dark, I awoke to booms of thunder shaking the windows, and torrential rain clattering on the roof. 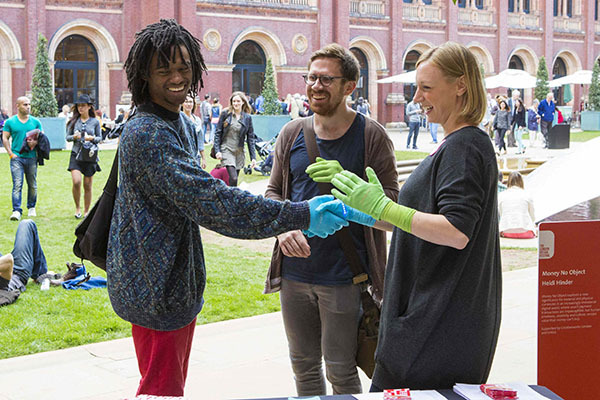 This did not bode well for the weekend ahead, when my design interactions project, Money No Object, was due to be showcased outdoors, in the garden of the V&A. 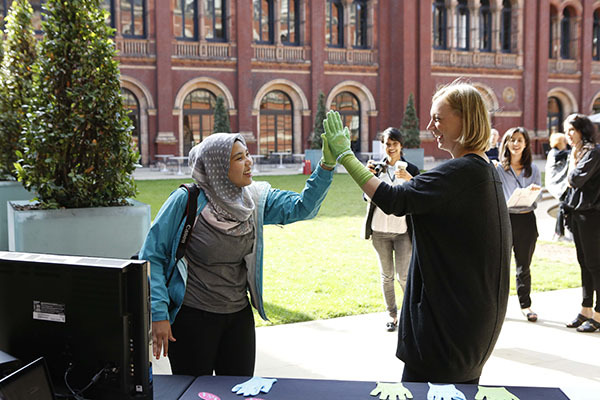 During the months of preparation, I had been imagining the Digital Design Weekend, an exciting programme of arts and technology projects curated by Irini Papadimitriou, and it was always illuminated by sunshine, in my mind at least, rather than by flashes of lightening. By the time I arrived at the V&A, the rain had subsided, and it was time to focus on the task of installing the last of three temporary artworks on the museum donation cases, before the building opened to the public at 10am. Growing Donations would conclude my series of experiments that have been exploring the potential impact of design practice on the amount and regularity of visitor donations to the museum. 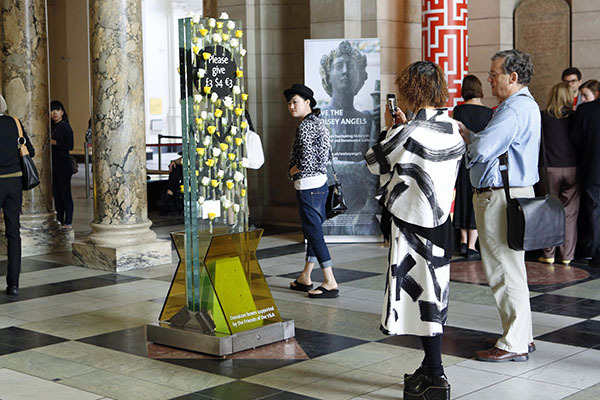 This particular installation aimed to test the theory that the presence of flowers supposedly inclines people to be more generous. 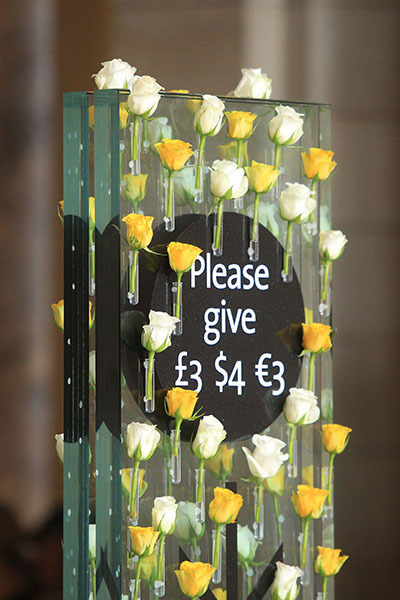 By covering the Grand Entrance donation case with one hundred white and yellow roses, I hoped that the museum would see a significant growth in the amount of money given, over the period of the installation. 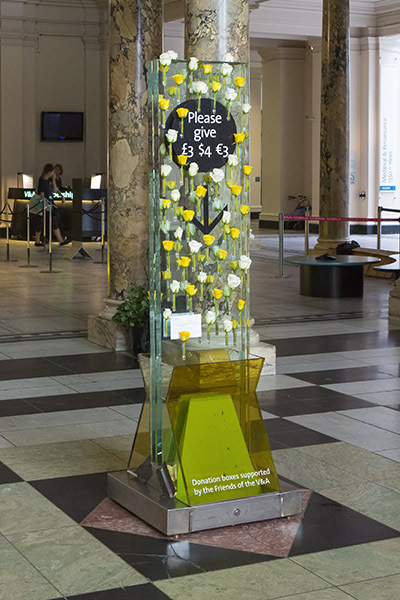 Once the flowers were in place, and the doors of the Grand Entrance opened to the public, it was encouraging to watch people noticing the donations case enough to stop and take photos of it, as well as to make the all important donation. Despite the visual brightness of this floral installation, the next day – the first day of the V&A Digital Design Weekend – started with more storms and such heavy rain that there was flooding across north London, where I was staying. 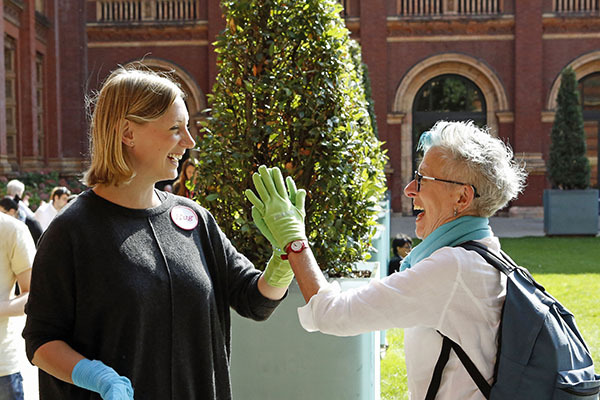 At the museum, the Money No Object team flipped a coin to decide whether or not to risk the garden set up – and heads we won, weather and all! 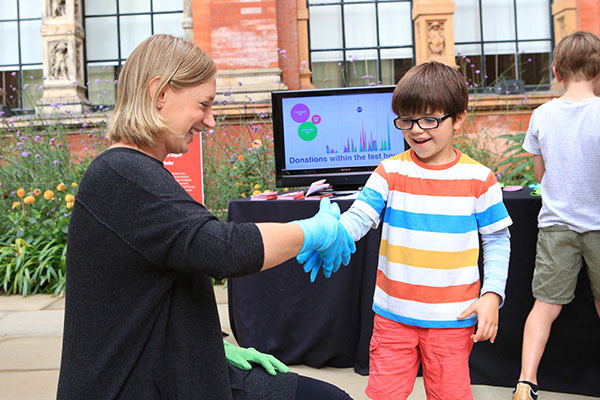 Throughout the weekend, it was so gratifying to see visitors enjoying the project, its speculative concept of physical gestures transacting a donation to the museum through wearable technology, but most of all, to watch people visibly delighting in the social exchanges and personal interactions. The smiles in the photographs are probably the best illustration of this particular approach to ‘Demonstrating Value’, as Money No Object has been seeking to evidence in a cultural context, thanks to Creativeworks London, UnLtd and MasterCard.